Adding Quote Actions to your Website Quoter is a great way to fit your Website Quoter to your business practice. Quote Actions appear as an button in the quote results which can link to either a url, or an online form. 5. Once in Lead Flow, navigate to the Custom card and select "Enable." This will take you to the settings for the Quote Action. 6. Click "Create New Action" in the upper right-hand corner. 7. Under New Quote Action, select the type. 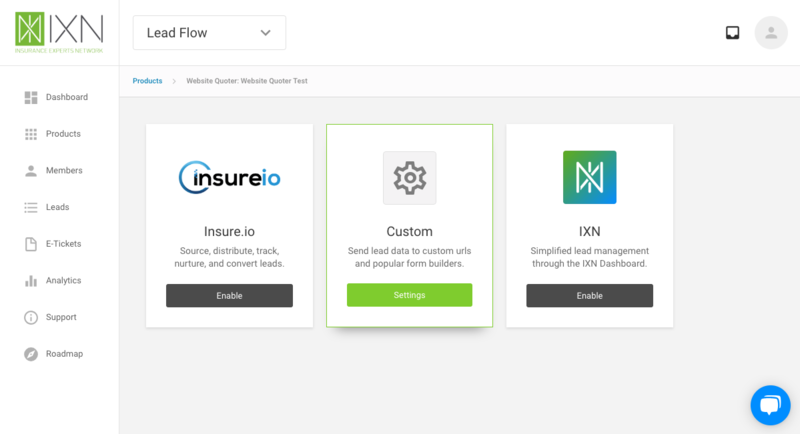 If you are using our integrations with 3rd Party Form Builders please follow the respective guide. All other types of links would fall under Custom URL. URL - a web link is required to complete the Quote Action. 8. Select the Carriers you would like the Quote Action to apply to. You can also designate specific carrier products you would like the Quote Action to show for. In the Website Quoter you can set up multiple Quote Actions to apply to the same product. 10. Save changes and your done! The Quote Action should appear in your Website Quoter right away. You may need to refresh your webpage to view the change. This is the most versatile Quote Action. Any web link can be added as a Quote Action in the quote results. Some use cases may include: linking to a page on your agency's website, linking to any online application, or linking to a webpage to provide more information. If you are looking to build out a more complex, custom form, then this is the way to go. Using powerful form builders such as Google Forms, Cognito Forms, and TypeForm, you can build web friendly forms exactly the way you want them, then assign them to any product, carrier, or combination of products and carriers. Submissions through form integrations can be sent to one or more email addresses. 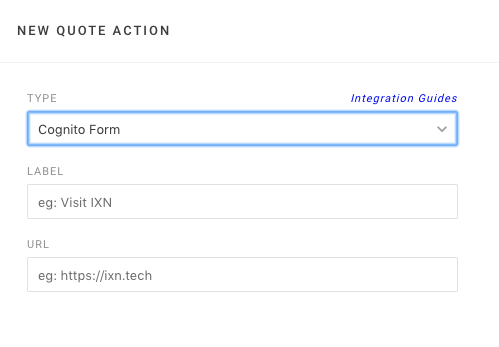 In addition, when an consumer starts a form through one of our form integrations, quote and product information will be pre-filled in the form. View a full list of Integrated Form Builders.